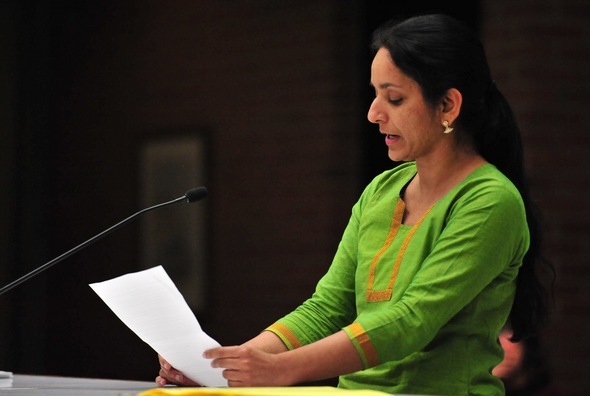 Posted on Tue, Jun 5, 2012 : 5:59 a.m.
Ann Arbor resident Sumi Kailasapathy urged Ann Arbor City Council members to hold off on taking action on items related to a new train station Monday night. "We should not be pouring tax dollars down the drain for a phantom transit plan," Kailasapathy said. The city of Ann Arbor is moving ahead with a closer evaluation of its options for building a new Amtrak train station somewhere inside the city limits. That includes consideration of redeveloping the current Amtrak station on Depot Street, as well as the possibility of building a new train station on Fuller Road. The Ann Arbor City Council voted 9-2 Monday night to finally accept a $2.8 million federal high-speed rail grant that was awarded to the state more than a year ago. It's now being made available to the city through a contract with the Michigan Department of Transportation. Mike Anglin voted against accepting a $2.8 million federal planning grant for a new train station Monday night. Following acceptance of the grant, the council voted 9-2 Monday night to approve a $196,192 amendment to the city's contract with SmithGroup JJR for more work related to conceptual planning and environmental documentation for the train station project. Council Members Mike Anglin, D-5th Ward, and Jane Lumm, an Independent who represents the 2nd Ward, were the only dissenters in both votes. "I'm just afraid that we're about to embark on something that's going to be a big boondoggle for our little town here," Anglin said. "I caution others that this could be a $60 million project that we're going to commit to down the road, and I don't think we have the money for that." A local share of 20 percent — up to $701,600 — is required for the city's acceptance of the $2.8 million federal grant, said Eli Cooper, the city's transportation program manager. Cooper said money the city already spent in previous planning, dating as far back as February 2009, will cover the entire match, so no new city funds are needed. "At this time, the item before the council does not require additional investments to complete the work that's before us," he said. The resolution approved by council states that completion of the grant-funded tasks will allow for future final design and construction of an improved intercity passenger rail station in Ann Arbor to improve the existing Amtrak service on the Detroit-to-Chicago corridor. Cooper clarified that the city isn't locked into going forward with construction of a new train station by spending the planning grant. In the new documents approved by council, the city's proposed Fuller Road Station project is now being called the Ann Arbor Rail Passenger Station project. That's an acknowledgment that the location isn't fully decided yet, though Mayor John Hieftje and Cooper have seemed determined for the last few years to see a new train station built in front of the University of Michigan Hospital on Fuller Road. At one point the university was going to build a 1,000-space parking garage as part of the first phase, but those plans changed. U-M is now building its parking elsewhere. The city plans to have JJR take a close look at the feasibility of redeveloping the current Amtrak station versus building a new train station on Fuller Road. Cooper said the city will be talking with the federal government about what other sites, if any, should be evaluated further. Cooper assured Lumm that the city will exhaustively evaluate the existing Amtrak station to prove it's viable or not viable. Cooper said about $737,785 has been spent to date planning for a new train station. Anglin pointed out the city also spent about $1.2 million to relocate utility lines along Fuller Road. "I don't know why we're in the railroad business," Anglin said at one point. "That kind of confuses me. I don't think we're qualified to build a train station, to build a railroad, or anything like that. And I don't like the idea of any of our money going in that direction." The council authorized an original $541,717 agreement with JJR in August 2009 and later that year approved a $111,228 amendment. The latest $196,192 amendment — fully funded with the federal rail grant — is for continued planning efforts that build on the previous work completed by JJR, including revisions to the conceptual plan and completion of required environmental documentation. Once those efforts are finalized, Cooper said, the project can move forward into the preliminary engineering phase, which will be done under a separate contract. A handful of residents, including City Council candidates Jack Eaton and Sumi Kailasapathy, as well as members of the Sierra Club, opposed the council's action Monday night. They're against building a train station on the footprint of a parking lot in Fuller Park, and they also have concerns a solid business plan hasn't been presented yet. "We should not be pouring tax dollars down the drain for a phantom transit plan," Kailasapathy said, urging council to hold off on taking action. "I, for one, am a bit confused by it all because I thought we were having an intermodal station for a time. We talked about commuter rail," Anglin said. "Now we're talking about an Amtrak station. So for me this is very confusing and I would imagine it's pretty confusing to the public." Other council members offered a more positive view of the fact that $2.8 million in federal grant money is coming to Ann Arbor to help plan a new train station. "I'm excited about this going forward and it feels to me like we're on the verge of something that's pretty great for the city," said Council Member Sandi Smith, D-1st Ward. "This is certainly the longest we've ever discussed accepting a grant, I think," Council Member Carsten Hohnke, D-5th Ward, remarked about an hour into the debate. Multiple council members made reference to the city of Troy, whose conservative Republican leadership made national news last year for turning down $8.5 million in federal grant money that would have fully funded a long-planned transportation center there. "We have to prepare for mass transportation to serve a lot of people and that's the way of the future," said Council Member Tony Derezinski, D-2nd Ward. Council Member Sabra Briere, D-1st Ward, noted the current Amtrak station was built many years ago with a mix of state and local dollars and grew out of a citizen committee. "It's my understanding that unless we receive additional dollars, we do not expect to build anything," she said of the vision for a new train station. Hieftje stressed that the city's acceptance of the grant and proceeding with planning will in no way compromise the city's ability to pay for essential services like police and fire. Briere asked whether it's the city's intent to provide any funding for operation and maintenance of a rail system. Cooper said the answer is no. "It is in fact a difficult decision, I'm sure, for council members when confronted with dealing with the day-to-day issues of today versus making an investment in an asset that will serve the community for decades, if not centuries," Cooper said at one point. Cooper said he's been in talks with MDOT and Amtrak and all agree that train stations are local issues to decide. He said Ann Arbor was selected for the $2.8 million grant because its Amtrak station is the busiest in the state of Michigan and the second busiest on the Detroit-to-Chicago line. He said the current station on Depot Street is not adequate to meet current demands, and that's even before taking into consideration anticipated growth. He reminded council members the federal government has awarded nearly $500 million to Michigan to acquire and upgrade the tracks between Detroit and Chicago. This past April, he added, there was another announcement of the Federal Railroad Administration and Amtrak purchasing bi-level passenger rail cars, increasing capacity. "So the number of people who will be traveling along the line, and then theoretically in and out of the Ann Arbor station, will increase," he said, adding that Amtrak now estimates its ridership will roughly double over the next 25 years as more cars are added. "It's well recognized that during certain times of the year now the current Amtrak station and all the parking around it is 100 percent consumed," he added. Cooper also said Amtrak designs now require a 1,000-foot loading platform. He said the current platform is not nearly that size and the intent is to have 1,000-foot-long trains. "That's the enormity of the type of infrastructure that a national high-speed rail system or higher-speed rail system requires," he said. "And that is the opportunity we have before us to allow Ann Arbor to position itself in order to continue to serve as a leading community that provides first-rate, world-class transportation in and out of our city." Smith said she witnesses people coming and going from the current Amtrak station who have to lug suitcases up and down tall flights of stairs and across the Broadway bridge. "They've got their 30-pound suitcases with them, and they go up a long flight of stairs, across the Broadway bridge, down another flight of stairs, to find their car in some parking lot without any lines on it, and they're all kind of parked every which way in some random fashion," she said. "And it's clear that we've outgrown the space that we have." Wed, Jun 6, 2012 : 2:22 a.m. Wed, Jun 6, 2012 : 7:19 a.m. Wed, Jun 6, 2012 : 1:50 a.m. The past is the best predicter of the future. For at least 30 years there have been repeated promises of improved rail service - more trains, &quot;higher&quot; (note - not &quot;high&quot;) speed rail, and whatnot. But this improved service has never arrived. I doubt if it ever will. Nonetheless, promises still keep being made. This reminds me of Lucy and the football. Tue, Jun 5, 2012 : 11:58 p.m. Wed, Jun 6, 2012 : 7:18 a.m. They can't even give parking tickets after hours or on weekends. Ever see a handicapped space used by a UM student downtown by Main St? I do a lot and the AAPD never does. All they do is man speed traps or are too busy chasing criminals since the silly mayor has cut their numbers so much. An idling train is an untouchable in Ann Arbor. But not an old lady walking on the tracks. Tue, Jun 5, 2012 : 8:10 p.m. Eminent domain - Gandy Dancer. Now you got your 1000 foot platform. Tue, Jun 5, 2012 : 7:53 p.m.
Jack Eaton is correct: If you appreciate your local park, just know that &quot;your&quot; park is equally at risk for repurposing, as any part of Fuller Park, if the city proceeds with building a train station on park land. What will protect any park, if the precedent of repurposing park land is the outcome? The history of Fuller Park is that in the 1930s it was the first golf course in the city, then it became a park, then a &quot;temporary&quot; parking lot. Today, its status could be reversed, the pavement removed, and the land returned to park space, usable by the many soccer players who use other nearby fields, as just one example. A train station and parking structure? Not so easily reversible. Let the voters decide. Tue, Jun 5, 2012 : 6:52 p.m. Apparently if it's the busiest train station in the State of Michigan, Ann Arbor does need to upgrade it's current facility to meet it's current and projected growth. Wake up people -- it's no different than upgrading any other type of infrastructure for necessary growth. Tue, Jun 5, 2012 : 5:42 p.m. Since we are on the road to a &quot;big boondoggle&quot;, let's do it right and make it a really big one. Let's mimic the Old Penn Station in New York City and model the new waiting room on the Roman baths of Caracalla. That would especially satisfy the local artistic lobbyists who never pass up a weak excuse to waste public funds. Tue, Jun 5, 2012 : 5:06 p.m. Put is in the Are You Kidding? pile. That land, although partly covered with parking for many years, is parkland. It cannot be turned into a non park use without a general vote. Yet we have spent one million dollars planning to violate the citizens trust and develop that land as a non park use. If these past and new expenditures were put to a vote, how many people think it would pass? Would you vote for spending 700k dollars to plan for something that required another general vote to be built? I doubt the poorly represented people of Ann Arbor would vote yes to these preliminary expenditures. Not to mention the future burden of the debt it will take to build it, the huge traffic increases in the area which already suffers from congestion, the potential environmental impact, the loss of parkland, etc. The bait and switch methods this mayor and council use to get things done IS back room policy making. Does anyone seriously think that we are well represented by this administration? All they do is spend spend spend. Accepting this grant just cost us $60 million. That is poor planning no matter how you look at it. Tue, Jun 5, 2012 : 5:09 p.m. Put THIS in the Are You Kidding? pile. The staff can make corrections without showing it but comments cannot be changed. The typo was a result of having to edit that first line, I'll leave it to your fertile imaginations to guess what I had originally said. Tue, Jun 5, 2012 : 5:04 p.m.
Tue, Jun 5, 2012 : 5:01 p.m. Kudos to Mike Anglin and Jane Lumm for their stance on this issue. I am disappointed at Councilperson Sabra Briere for her position. Has she joined the Council Party? Tue, Jun 5, 2012 : 4:49 p.m.
About $737,785 has already been spent to date planning for a new train station? Almost 3/4 of a million dollars just for planning? For that money, we could have purchased the Gandy Dancer and converted it back to a train station! Wed, Jun 6, 2012 : 7:07 a.m.
Fools like the current city council, minus 2 sane members, voted to sell it away for pennies years ago and then spend taxpayer money to build the &quot;beautiful&quot; present station that thy now want to tear down. Fools all but two, led by one. Maybe not, if they had a crystal ball and could see DTE leaving. But then even knowing that, with the BIG badly needed parking lot, they want to move away. Fools all but 2. Tue, Jun 5, 2012 : 4:14 p.m.
Let me assure you that I am not a Tea Party member or supporter. Last year Marcia Higgins (with whom I've had many disagreements) was opposed by a Republican whose web blog expressed support for Tea Party ideas. I decline to support him because of his Republican/Tea Party positions. I am a progressive Democrat who is active within the local Democratic Party. I do believe that some local Democratic Party office holders are giving our party a bad name. I am not a Tea Party sympathizer. I am not opposed to building a new train station. I am opposed to the City providing the local financing for an Amtrak station and I am opposed to building any train station on property that has been designated as parkland without voter approval. The Dearborn train station was 100% funded by federal funds. The local share for Ann Arbor, just for the this first grant, is about $700,000. While the Council claims we cannot afford more public safety staffing, should we be spending this money on a station for Amtrak? I oppose putting the station on parkland because it would create a terrible precedent. Paragraph 2 (a) of the Public Land zoning provision provides that land designated as parkland cannot be used for structures inconsistent with the parkland use. The Council seems insistent on ignoring that limitation. If we use that parkland for a train station without seeking voter approval, no park in town is safe from re-purposing at the whim of the Council. I know that name calling is easier that policy discussions, but really, &quot;Tea Party&quot;? Nothing could be further from the truth. Wed, Jun 6, 2012 : 5:50 a.m.
Jack: You may be surprised how close Tea Party folks are together with progressives on certain matters. I think the key joining part is a responsible government. Jack - what are you going to do to improve your vote total compared to 2010? Do you really think you can beat Margie Teall? Is the Fuller Road project something that the public can rally behind you on in your vocal opposition? Tue, Jun 5, 2012 : 4 p.m.
Ellis and Carole: Not accepting this grant would have been the big mistake. The federal money would just go to some other town for their new station. This is nothing like waterstreet, not even close. By accepting this the city is under no obligation to do anything else. It leaves open the opportunity to build a new station like Dearborn is doing and as someone mentioned, they have half the traffic Ann Arbor does. The city gets to use dollars already spent, no new money. If you are against rail, then I guess you won't like this but it won't put the city in debt. Besides, it looks like ann arbor's budget is in better shape than any city in the state and probably most in the nation, with no tax increases. Tue, Jun 5, 2012 : 4:46 p.m. I don't know Brad, the cops are still arresting the bad guys, the parks are looking better. But hey, what city has not had to cut back in the great recession? No matter how you slice it, ann arbor is in way better shape than most. Tue, Jun 5, 2012 : 4:33 p.m.
No tax increases but lots of service decreases. Tue, Jun 5, 2012 : 3:11 p.m. I don't understand this action at all. Tons of dollars have already been spent for what I believe is nothing tangible at all. $700K plus for planning a new station, please. There are better ways to be spending these federal dollars. Wed, Jun 6, 2012 : 6:59 a.m.
How sad, not long ago that would have built a new station, or at least remodeled what we have, and repave the DTE parking lot, to boot. Oh, that mayor is so silly. Tue, Jun 5, 2012 : 2:48 p.m. Some in Ann Arbor, including a few on City Council, operate on the delusion that Ann Arbor is a world class city and, as such, should have and can afford things like monorails and extensive passenger rail service. This would be all right if Ann Arbor were a world class city, but it is not; it is not a major city; it is not even a large city. Such dreamy overreach on the civic purse can leave the citizenry on the hook for huge amounts of money and put the city in fiscal disaster. We need only look to Ypsilanti and its Water Street Project to see what happens when elected officials execute grand plans on the public's dime. Tue, Jun 5, 2012 : 2:17 p.m. I'm 100% pro-rail, but I'm also on board with the Keep It Simple philosophy. Why not just acquire and redevelop the DTE property? It has MORE than enough acreage for a significant modern multi-modal transit facility; it would require moving the existing station no farther than just across the tracks from the existing site; and, should north-south commuter rail ever come to fruition, it's about 50 meters from the Ann Arbor Railroad line. (Remember, one of the major hang-ups from the AARR about commuter rail is the liability of passenger trains crossing the Argo bridge; a multi-modal station on the DTE property would be just steps from the point where an AARR train would stop *before* the bridge). So... kudos to the City for landing the federal grant. Now can we please give the DTE facility some serious consideration? Tue, Jun 5, 2012 : 4:24 p.m. Very good points. The grant includes funding to complete an environmental assessment, which is supposed to consider alternative sites. Unfortunately, by contracting with JJR to do the work (or actually extending its existing contract), the deck is stacked toward the Fuller Park site. Before even completing the environmental assessment, JJR's work plan lists as a &quot;deliverable&quot; a Finding of No Significant Impact for the Fuller Park site (that decision is actually the prerogative of the Federal Railway Administration, not JJR). Even as they analyze the potential of remodeling the current Amtrak site, their arguments will be steered toward justifying the Fuller Park site. Tue, Jun 5, 2012 : 2:12 p.m.
You can laugh Alan but it seems like the truth is in their statements. They are positioned well to the right of the business community and in line with the Troy Tea Party. Hard to see how &quot;backroom&quot; deals go down at televised meetings but then everyone here knows the mayor could swim out and save a drowning child and you would criticize his technique. You're right, the grant is not site specific, that is still open. But the Fuller site is the best choice. A park? It has been a parking lot for 20 years! This city has beautiful parks everywhere. Using a parking lot for a train station will do a lot more for the environment than having another piece of grass to mow. Tue, Jun 5, 2012 : 1:54 p.m.
&quot;The stance taken by Ms. Kailasapathy and Jack Eaton is very similar to the Tea Party Mayor and Council members in Troy when they said NO to federal money for a new train station.&quot; Calling Jack Eaton and Sumi Kailasapathy somehow sympathetic to the Tea Party or closeted republicans is just LAUGHABLE. It's the Mayor and his watered down Rick Snyder kiss kiss kiss wimpy leadership that should make the Tea Party Mob smile. It's the backroom deal the Mayor tried to pull off with the U of Michigan for the Fuller Road Train Station that has and should make everyone skeptical when it comes to this issue-including accepting this 'grant' without a clear cut plan of action or assurances he won't use it for an end run around an open and transparent process for a new station. The Mayor and others still want a Fuller Road station and kudos to everyone at last night's meeting who wanted assurances this wasn't going to happen if the funds were accepted. Wish more Council members had the guts to ask those questions. In principle I support high speed rail. In reality I don't trust our Mayor for a second. Or for giving away (oh...'leasing') park land through a loophole. Tue, Jun 5, 2012 : 1:40 p.m.
Ann Arbor needs a new transportation center. Taking Federal money always involves a lot of strings or red tape. Ann Arbor is suppose to be one of the smartest cities in the US do you really think you can take this $2.8 million dollars and build what you want and need ? or is it going to be a huge pink elephant that nobody is satisfied with? Tue, Jun 5, 2012 : 1:37 p.m. Sorry Silly Sal but you should look at a map, the DTE property that is being cleaned up is on the river, a long ways from the current station. Even further than the current AMTRAK parking. But more than parking is needed. This will become a major gateway to the city and put in the right place a new train station, with more trains, will take hundreds if not thousands of cars off the road. Tue, Jun 5, 2012 : 4:59 p.m.
Far away? it is exacly on the opposite side of the tracks, and they had to build a fence to keep people from using it. Dave Gear, please visit the site and try to park! Tue, Jun 5, 2012 : 1:31 p.m.
Pouring good money after bad. They'll spend and spend, and then use the past spending as the justification to spend more. They need to put this to a clear vote of the people and stop making secret back door deals. Of course the people voted on the &quot;justice center&quot; and the council ignored them on that. 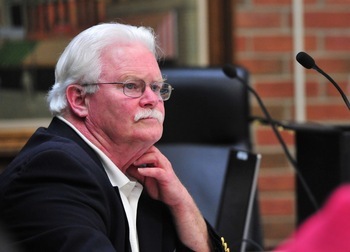 The stance taken by Ms. Kailasapathy and Jack Eaton is very similar to the Tea Party Mayor and Council members in Troy when they said NO to federal money for a new train station. The Troy business community was outraged and a recall was launched against the mayor. The council finally backed down and reversed their vote. In Troy the Chamber of Commerce led the charge to overturn the original bad decision. The Ann Arbor Ypsilanti Chamber is in favor of a new station for Ann Arbor. It is interesting that candidates running as democrats are to the right of the business community. Ann Arbor's current train station is outdated, shabby and in the wrong place. A new train station for the busiest rail stop in the state is a good investment at twenty cents on the dollar. The city has willing partners in the UM, AATA and MDOT to help make the final match. Wed, Jun 6, 2012 : 12:10 p.m.
Tue, Jun 5, 2012 : 1:27 p.m. In this short article, Mike Anglin was quoted directly three times as being confused. Nothing new there. Keep up the good work, Mike! Tue, Jun 5, 2012 : 2:16 p.m. I think he uses the &quot;confused&quot; terminology rather than what he realliy means, which would be inappropriate (but accurate) for a council session. He's &quot;confused&quot; like Columbo. Tue, Jun 5, 2012 : 1:14 p.m.
&quot;It's well recognized that during certain times of the year now the current Amtrak station and all the parking around it is 100 percent consumed,&quot; he added. Is he nuts? Next door is a huge parking lot that belongs to DTE and this most silly mayor now wants to turn it into a park and then take a very nce park that doesn't have toxic soil under it, and turn it into a parking lot. Has he been listening to too much Joni Mitchell? Repave part of the DTE lot and be done with it. Don't spend my money, Spend the mayor's money. But he sits on his wallet. This silly city never shouild have given up the Gandy Dancer location for the present train station location, spending money to do so. So, so silly! So is this mayor. Wed, Jun 6, 2012 : 3:24 a.m.
@Brad: &quot;Garage Mahal&quot;! Great name! Well done, sir! Tue, Jun 5, 2012 : 2:14 p.m.
Have a satellite parking lot and have AATA busses shuttle people between there and the existing Amtrak station. Heck, they can park in the new Garage Mahal on 5th (assuming it ever opens). Then you could take over the current parking lot and expand the terminal. Any other questions? Tue, Jun 5, 2012 : 1:12 p.m. I am more likely to live to see an active Ann Arbor teleportation hub than a 110mph rail line. The potential ridership is the same for either. Tue, Jun 5, 2012 : 12:57 p.m. The greater Los Angeles area built a medium speed rail system that took over freight tracks, increasing speeds from about 40 MPH to 79 MPH, and greatly increasing the frequency of the trains. In their haste, they did nothing to improve the railroad crossings, leaving the 1940s to 1960s era crossings mostly untouched. While they med the inadequate Federal Railroad Administration (FRA) and Federal Highway Administration (FHWA) standards, the accident rate quickly increased and the death rate. Soon, Metrolink and its sister agency, MTA lead the nation in trains striking motor vehicles and causing deaths and injuries. Due to a poorly placed station that was placed between siding signals, a confused engineer, who was also texting lost &quot;situational awareness&quot; and caused a head-on collision with a freight train, killing about 23 people in 2008. This crash was identical to a Marland MARK train crash that the NTSB had investigated in 1996. Sadly, those who are rushing to place higher speed rail in SE Michigan such as Carmine Palombo, SEMCOG's director of transportation programs, was unware of this crash or this NTSB study. And he was a principal in charge in placing stations along the route. In the rush to accept federal funds, is Ann Arbor making the same mistake that was made in southern California and Maryland? Our officials so far have their heads down and only see federal green. Tue, Jun 5, 2012 : 12:36 p.m.
Not sure what Ms. Kailasapthy was talking about, nothing &quot;Phantom&quot; about AMTRAK it has been around for a long time. She sure does not sound like a progressive democrat. Nor does Jack Eaton. They should be honest with voters and run as Republicans. The whole rail line is being upgraded to 110 MPH. This is great news. Lets get this train on the tracks! Tue, Jun 5, 2012 : 4:04 p.m. Both Kailasapathy and Eaton are true blue Democrats through and through, who have held leadership positions in the A2 Democratic Party. Tue, Jun 5, 2012 : 1:30 p.m.
&quot;Not sure what Ms. Kailasapthy was talking about, nothing &quot;Phantom&quot; about AMTRAK it has been around for a long time.&quot; Oh, it's real..... Real slow. It's great for people who do not live by any particular schedule. Tue, Jun 5, 2012 : 12:25 p.m. I asked the mayor why it took so long for the city to decide to accept the rail grant. He said it took some time for the city and the FRA to get on the same page and that was complicated by the partnership with U-M.
Tue, Jun 5, 2012 : 12:23 p.m. Doing nothing is not a viable option. We do need to address the growing need for transportation alternatives. Get on board or get left behind. Tue, Jun 5, 2012 : 1:03 p.m.
Tue, Jun 5, 2012 : 1:02 p.m.
Or die at a dangerous railroad crossing as my mother did in the Los Angeles area. She was the 10 accident and 3rd death, and like the other 3, she did not see the crossing as it was so poorly marked and the busy intersection was the greater distraction. Tue, Jun 5, 2012 : 12:16 p.m. Wed, Jun 6, 2012 : 11:27 p.m.
Then let us build it where there is an existing train station now. On Depot street. Given for the same thing that trains come into and drop people off at. Enough said. This area is what is was originally intended for. Can't wait to see what Ann Arbor comes up with. Hopefully not another bus station half baked. Tue, Jun 5, 2012 : 8:25 p.m.
Tue, Jun 5, 2012 : 1:20 p.m.
Tue, Jun 5, 2012 : 12:31 p.m.
Tue, Jun 5, 2012 : 12:06 p.m. I would be in favor of the Fuller Road project only IF two things were done: 1) Put it to a vote of the people. No one believes that a +$60 million facility will be built and it will ever be a park again. If the voters don't approve it, drop it. 2) Fund the local match not with city taxpayer funds but by having the private sector build a 10+ story medical office building above the station's parking garage. This could easily raise $20 million for the city. This ought to be scoped put now, during the planning phase. Wed, Jun 6, 2012 : 3:44 a.m. Put the mayor's office on the 10th floor! Either the problem will be solved, or another will be. Tue, Jun 5, 2012 : 7:08 p.m. I would think you might be philosophically opposed to a 10+ story building given the difficulty the fire department would have above the 7th floor. Tue, Jun 5, 2012 : 11:23 a.m.
Just build the Fuller Station and get on with the 21st century! Tue, Jun 5, 2012 : 11:19 a.m.
Bcar, you should do your homework, the city has not raised taxes in over a decade except for voters asking them to take over maintenance of the sidewalks and that was tiny. As to listening to the citizens, they are! Except for some posters here all I hear about having more rail service is FULL SPEED AHEAD! Tue, Jun 5, 2012 : 11:31 a.m.
You keep hearing it because you keep saying it. Tue, Jun 5, 2012 : 11:17 a.m.
&quot;I don't think we're qualified to build a train station, to build a railroad, or anything like that.&quot; If underground parking garages are any indication, Anglin is 100% correct. Tue, Jun 5, 2012 : 4:06 p.m.
Sally, it sure looks like the two new stadium bridges are going up rather quickly and roads are being redone all over town, including Packard. Maybe you should get out more. Tue, Jun 5, 2012 : 1:16 p.m. They can't build a bridge, either, or repave the roads, or finish Packard, or do much of anything but dream. Dreamweaver! So, so silly! Tue, Jun 5, 2012 : 12:45 p.m.
Sure, make excuses for the inept project management. Oooo - &quot;it's complicated&quot;. Late? No, WAY late. I know because I regularly have to drive around the disruption like I've been doing for YEARS now. Tue, Jun 5, 2012 : 12:40 p.m. But Dearborn is qualified to build a train station? I bet the parking structure turns out to be excellent. It is late but it's a complicated project. Better to get it right. Tue, Jun 5, 2012 : 11:47 a.m.
Because that's also a city project? Tue, Jun 5, 2012 : 11:15 a.m. This is spectacular news! Very glad to see this finally moving along. The whole rail line is being completely overhauled. I was on a train a going 110 MPH west of Kzoo a few weeks ago. The state is going to upgrade the whole line. AMTRAK is getting all new trains. All of the hold ups waiting for freights will be fixed, smooth tracks ahead! $500 million was awarded to Michigan for rail. Even the governor signed on and came up with matching funds. Ann Arbor is already the busiest train station in the state and has outgrown the current dog-eared station. In addition to the faster long routes, there is huge potential for commuters using the train when they add more trains. Tue, Jun 5, 2012 : 1:18 p.m.
Answer me this question. Where will the money come from to pay for it? Please be specific, I am trying to understand your reasoning, keeping in mind the country is 16 trillion in debt and has obligations to pay the retirement benefits of public employees which have been estimated to be 3 times that amount. Are you planning on reneging on pensions or cutting them in half? Please enlighten me. Thanks. Tue, Jun 5, 2012 : 10:56 a.m. Kudos to Sumi Kailasapathy and Jack Eaton for speaking up and asking tough questions. Thanks to Jane Lumm and Mike Anglin for their votes. No thanks to Sabra Briere who apparently thinks caving on several issues will somehow get her a ticket to run for Mayor down the road. Tue, Jun 5, 2012 : 11:02 a.m.
Oops - hit the wrong button. I meant to vote &quot;up&quot;. Tue, Jun 5, 2012 : 10:43 a.m.
As our federal government drives us deeper into debt, at the same time our jobs move off shore and our earning power shrinks, we will need mass transit to move us great distances to low paying jobs. Not a good picture of our future. This is a grant. I did not realize that we had the money, as a nation, to pay for something that has not shown growth. Maybe this will become another Solyndra or A123 Systems. Our city council and leadership has shown a lack of visionary leadership. So, much of what they say and think must be taken lightly. Tue, Jun 5, 2012 : 10:35 a.m.
Tue, Jun 5, 2012 : 1:19 p.m.
Wake up, little Suzie, wake up! Tue, Jun 5, 2012 : 12:12 p.m.
You don't understand that this is an ideology and as long as there remains a breath in their body they will not back off. The fact that we don't have the money to pay for it does not seem to matter. The attitude is we can always print or borrow more. I would guarantee that progressives don't spend their personal money like they do public money. What's puzzling is the disconnect for fiscal responsibility between their personal lives and public money. Tue, Jun 5, 2012 : 11:04 a.m.
Time has shown that they will not listen. Just remember, they were voted into office by the silent majority of voters. Does not bode well for the future of Ann Arbor, does it?